The Episode starts with a storm hitting Ujjaini. Vikram protects the people of Ujjaini. Acharya ji tells that Maharaj don’t sit idle seeing destruction of his people. The imposter thinks he has to proved himself as the Maharaj and fires an arrow in the sky to stop the storm. The imposter tells that he is Chakravartin Samrat Vikram Aditya and did what he thought. Acharya says you are our Maharaj. The real Vikram tells that you are doing mistake and says I am the real Maharaj. Acharya ji asks him to keep quiet. The imposter asks soldiers to arrest the imposter. He asks Maharani not to worry as the imposter is caught and her husband is infront of her. Padmini says I can’t take a decision even now. She comes home and looks at Maharaj’s pic. She thinks what is this dilemma and tells that she couldn’t identity her soul mate. Acharya ji says decision is taken, and says Maharaj got away all the trouble. Kalidas tells that the imposter is in karagar. Padmini says something is wrong for sure. The imposter/Vish purush comes to Bhadrakaal and says Vikram is in Karagar. Bhadrakaal asks Vish purush to give death sentence to Vikram and take all his powers. Vish purush leaves. Bhadrakaal thinks once you die, I will send Vish Purush to pret ghaati and will get Betaal here. Padmini asks if the man was imposter then why did he keep quiet? Acharya ji says your doubt is right. Vish Purush comes there and says you are talking to Maharani leaving me. Acharya says he was talking about the imposter. Vish purush tells that he will give death sentence to him. Padmini argues and says how can you kill him. Vish Purush says I have decided to kill right now. Padmini thinks Maharaj never did hurry to take a decision. Vikram thinks may be that imposter knows the solution and that’s why did this. Maharani comes to meet Vikram in the karagar. Sainik tries to stop her. Padmini says whose decision is important at this time. Vikram gets happy seeing him. Padmini asks who are you? Vikram says I am your husband etc. Padmini says Maharaj decided to give death sentence to you. Vikram asks her to look in his eyes and tell. Padmini says she is doubtful. Vikram tells about their marriage and his words. He says I told you that I can never love you, but I fell for you. he says how I will prove my identity now. Padmini calls him Maharaj and says you are my real Maharaj. She says that imposter have your avatar, but don’t have your heart and love. She says she will expose him right now. Vikram says then your life will be in danger and asks her not to tell anyone. Padmini says no and says she has to do something. She leaves. Vish Purush comes infront of her and says I know that you met that imposter. He says I don’t want you to make your life in problem. He tells that even Asurs takes the support of the strong person. He says he has all my qualities, powers and past moments, but I am just now. He confuses her and thinks morning will happen and you can’t do anything for your Maharaj. In the morning, Vish Purush tells the people that the imposter has no right to be alive and asks what punishment to be given. People says death punishment. The soldiers attack Vikram with the arrows. Vikram breaks his chains and throws the arrows away. He throws something on Vish purush’s foot and some of the blood spills down. Vish Purush asks Soldiers to catch him. Acharya ji thinks how can Maharaj blood is blue. He comes back to Palace and keeps the blood in the magical water. Padmini asks what you are trying to do. Acharya ji says this blue color will expose everything. They see him as Vish purush. Acharya ji says he is a Vish Purush. Vish Purush follows Vikram and says I will get your powers and kill you. Vikram asks who are you? Vish Purush says I am your Kaal and asks him to see his identity. He comes to his own self and tells that he will get his soul and help Bhadrakaal in his mission. Vikram stabs him and cuts his hands, but Vish Purush becomes fine and laughs. Precap: Vish Purush tells Vikram that there is only one way to get saved and says there is only one way and that is your death. 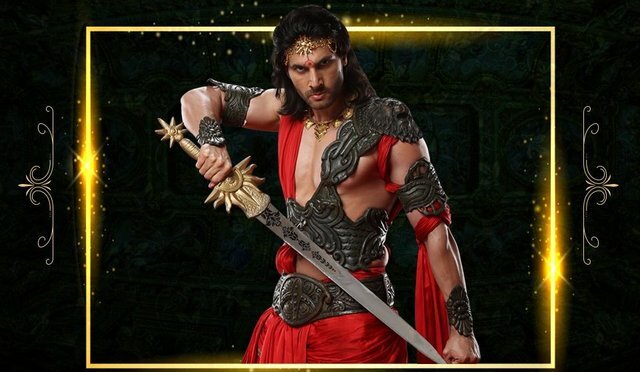 The post Vikram Betaal 4th March 2019 Written Episode Update: Vish Purush gets exposed infront of Vikram appeared first on Telly Updates.